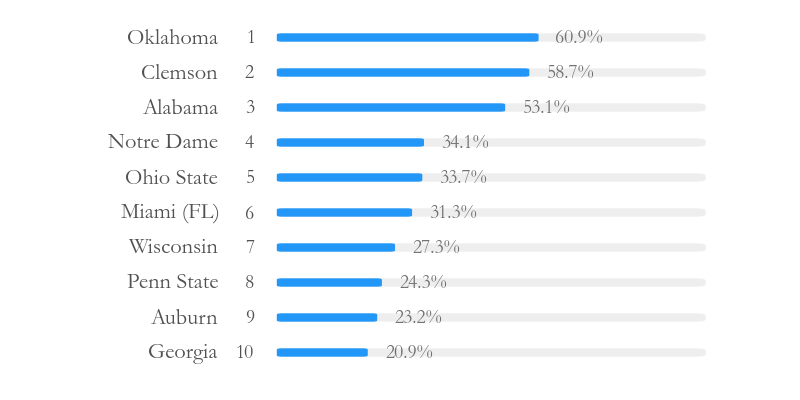 What’s the probability idle Alabama makes the College Football Playoff? Alabama sits at 5th in the committee rankings after their loss to Auburn. They will not play on this upcoming championship weekend. What’s the chance Alabama makes the college football playoff? The four teams ahead of Alabama (Clemson, Auburn, Oklahoma, Wisconsin) all play in their conference championship game. If these teams win, they’re in. By my numbers, there’s a 10.6% chance all four of these teams win. If one loses, it opens the door for Alabama. The problem for Alabama is that the 3 teams below them (Miami, Georgia, Ohio State) also play in conference championship games. The remaining opponent of one of the top 4 teams is TCU at 12th. 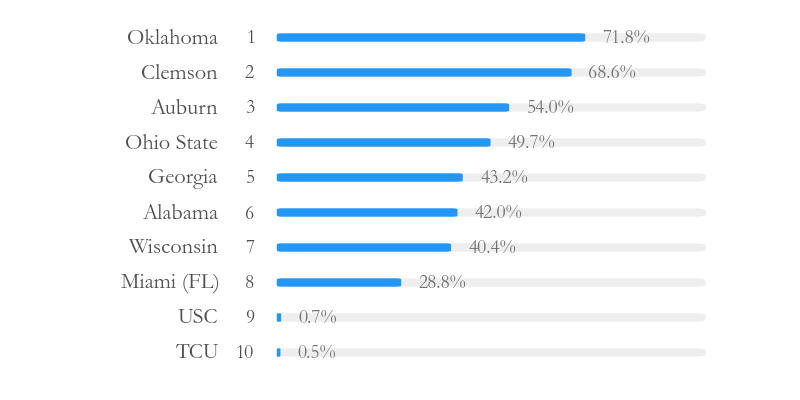 If TCU wins, they most likely don’t jump into the top 4, and Alabama makes it. My numbers give this a 28.9% chance. What if TCU loses but one of the other teams below Alabama wins? It depends on whether the committee moves this freshly minted conference champion ahead of Alabama. In my simulation, I have a parameter that assigns a probability to whether a conference champion moves ahead of an idle team. In the results above, I assume a 90% chance, which results in a 42% playoff chance for Alabama. It’s difficult if not impossible to assign a precise value to this parameter. It’s an attempt to model the behavior of fickle human beings. You could have a detailed model of this based on the record of the teams, strength of schedule, etc. However, with only sparse data, I choose to make it simple: one parameter fits all teams. If you assume a conference champion automatically jumps one spot over Alabama, then their only chance is a TCU loss. Their playoff odds are 28.9%. If you assume a conference champion never jumps over Alabama, then they make it if at least one team loses. This probability corresponds to 89.4%. (Take 100% minus the 10.6% chance for all teams to lose). The truth lies somewhere in between. FiveThirtyEight gives Alabama a 30% chance, the conference champion automatically jumps Alabama scenario. Massey-Peabody puts Alabama’s chances at 70%, suggesting that a new conference champion has a low chance to jump over the Crimson Tide. What’s the chance Alabama makes the playoff? We really don’t know, but this outlines the range of possibilities. Auburn still has a long road to the playoff. Cashing in on their 40% to beat Alabama at home is a good start. The numbers do not like the Pac-12. 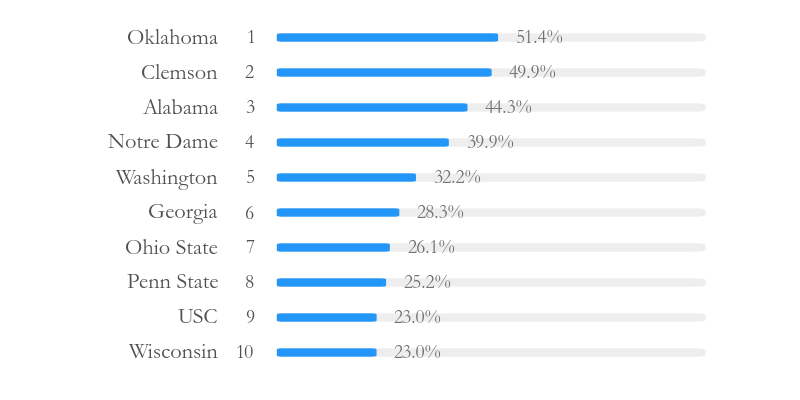 USC is 11th with a 14.9% chance to make the playoff, which means they need to win the Pac-12 championship game and hope a lot of other contenders lose. In the past 3 years, we haven’t seen a top contender lose in their conference championship game. This makes life easy for the committee. Don’t assume the same lack of chaos will happen this year. Three teams have become the favorites to make the College Football Playoff: Oklahoma, Clemson and Alabama. Don’t count out Notre Dame. The Fighting Irish got smoked by Miami in week 11, but they can still make the playoff if they win their remaining games against Navy and Stanford. It helps Notre Dame’s playoff probability that they don’t play in a conference championship game. They can’t lose and fall that final week of the season. However, my methods do account for the possibility that a team like Ohio State wins a conference championship game and jumps ahead of Notre Dame. There’s no certainty for the Fighting Irish. Miami moved up into the top 4 of the committee rankings with their big win over Notre Dame. However, they will be 4.5 point underdog in the ACC championship game to Clemson, and it’s unlikely both teams make the playoff. Penn State drops after their loss to Michigan State, and Oklahoma assumes the top spot after their win over Oklahoma State. Remember, this list does not rank teams by who would win on a neutral field. This reflects the odds of making the college football playoff, which depends on a team’s remaining schedule. Oklahoma still has TCU and West Virginia, but they get both of these teams at home. They also have a road trip to Kansas before a likely berth in the Big 12 championship game. While it isn’t certain that Oklahoma wins these remaining games, it’s an easier path than teams like Georgia and Notre Dame. Georgia travels to Auburn for a rivalry game with enormous college football playoff implications. If they win, you’ll see their playoff probability rise next week. My numbers give Georgia a 46% chance to win at Auburn. The win probability should perhaps be higher given that Auburn has injury issues on their offensive line. Notre Dame travels south to play undefeated Miami. My numbers make this a 50-50 game. I might lean a bit towards Notre Dame. The Fighting Irish have the best rushing attack in the nation with an experienced offensive line and running back Josh Adams. Miami has struggled this season against the run, as they rank 26th in my adjusted yards per carry. If Miami can slow down the ground game and make Brandon Wimbush throw, they give themselves the edge. Otherwise, it could be a long night for the Hurricanes. For more on the methods behind these calculations, click here. These calculations are based on my member college football rankings and predictions. To get a sample of these predictions usually reserved for paying members of the site, sign up for my free email newsletter. This episode of The Football Analytics Show comes in 3 parts. In part 1, I ask how many points RB Ezekiel Elliott, who got suspended for 6 games, is worth. How does this compare with QB Aaron Rodgers? In part 2, David joins me to discuss my college football playoff probabilities. 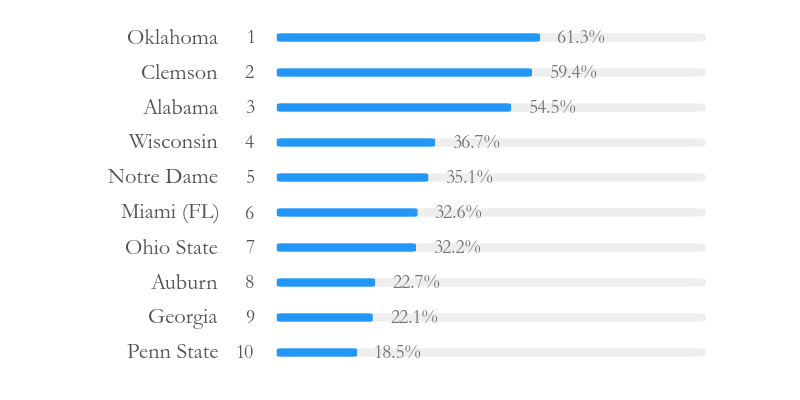 Why does Penn State have the highest probability? Why is Georgia so low? Can Notre Dame survive their remaining schedule? In part 3, I answer questions from listeners. Topics include data sources, games with the most value and how to get a prediction from adjusted yards per play.